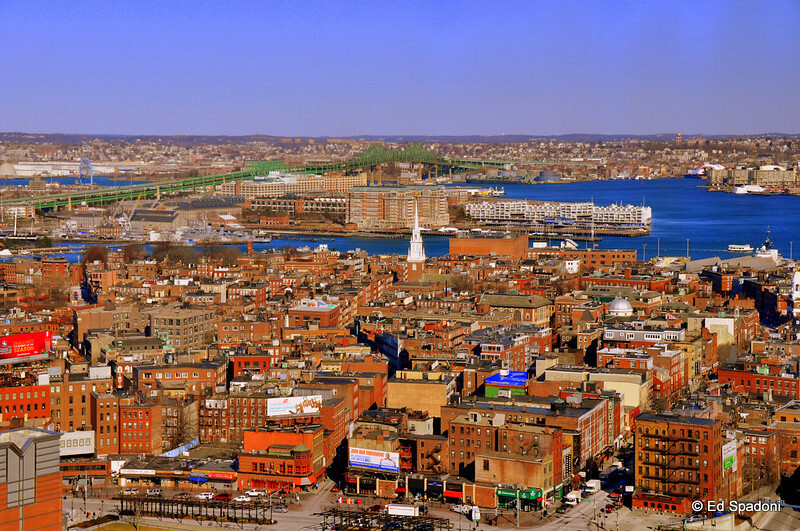 Boston's North End is the city's oldest residential community, where people have lived continuously since it was settled in the 1630s. Though small (⅓ mi²), the neighborhood has approximately 100 eating establishments, and a variety of tourist attractions. It is known as the city's Little Italy for its Italian-American population. The Old North Church (the white steeple seen in the center of this image), at 193 Salem Street, in the North End of Boston, Massachusetts, is the location from which the famous "One if by land, and two if by sea" signal is said to have been sent. This phrase is related to Paul Revere's midnight ride, of April 18, 1775, which preceded the Battles of Lexington and Concord during the American Revolution. Great capture. I love this part of Boston. Also notice that there is no smog. Great timing in catching this scene smog free. Very nice colors. The wide view works perfectly. Thanks for commenting on my "Throught the Eye..." photo. Yes, it is the Nikon 60mm micro lens. I got it exactly two Mondays ago and I love it! If you are on the fence on getting one, i'd say go for it. Glorious shot -- so colorful! fantastic color and light. looks like a photographers paradise. Wonderful shot Ed, so much color and detail. wow, neat, what a clear day ! Wonderful view -- love all the colors! What a clear day! Beautiful!